1949 Japanese painter Kei SHIBUSAWA was born in Kyoto, Japan. His real name is Eishun. 1967 After graduated from Meguro 3rd Juior High and Meguro High School, began paintings under Masataka OYABU. 1974 Graduated from Tokyo National University of Fine Arts and Music with a degree in design. The first solo exhibition. 1977 Became a part-time teacher in the Faculty of Arts, Tokai University (- 1980). Became a Buddist monk, stopped painting (- 1981). 1981 Became a part-time teacher in Odawara Women's Junior College (- 1985). 1982 Took a journey to China for the first time. Became a part-time teacher in Tokyo National University of Fine Arts and Music (-1989). 1985 Showed paintings at the exhibition titled "Today's Japanese Paintings; Yamatane Museum Award Exhibition". Became a part-time teacher in Kanto Gakuin Women's Junior College (-1989). Had the first major solo exhibition in Ginza Art Center. 1989 Showed paintings in Basel, Switzerland. Showed paintings at the exhibition titled "Japan Conception through Art Now" in Manly Art Gallery ＆ Museum, Australia. Became a professor in desgin department, University of East Asia (- 1997). Showed paintings at the exhibition titled "Contemporary Japanese Folding Screen Art" in Deutch, Ireland and Japan. 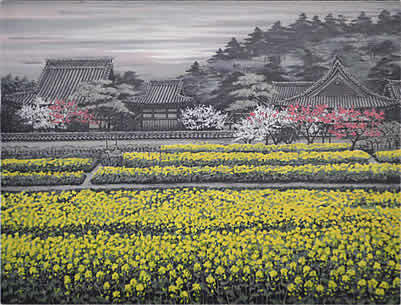 1991 Showed paintings at the Exhibition titled "Contemporary Japanese Paintings" in National Palace Museum, China. From this year to 2000, showed paintings at the exhibition titled "Exhibition of Today's Artists" in Tokyo, Kyoto, Toyama, Kanazawa and Nagoya Bijutsu Club every year. 1992 Showed paintings at the exhibition titled "Nihonga Exhibition in Barcelona; Four Seasons" in Sagrada Familia Museum. 1993 Had a personal exhibition in The Lefevre Gallery, London. Had a personal exhibition in Art Asia Hong Kong presented by Westwood International Inc, New York. 1995 Visited Shanghai, China invited by Chinese Government. Appeared on TV program "Art World". 1996 Showed paintings at Nagano Prefectural Shinano Art Museum. 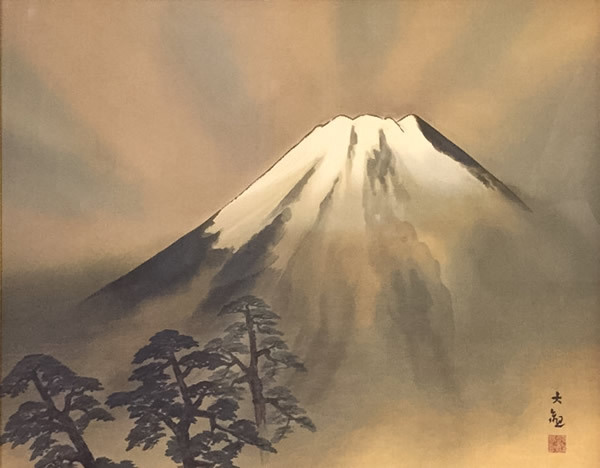 1998 Had a personal exhibition at Isetan Department Store Painting ”Kuon Shunko” was collected by Minobu-san Kuon-ji temple. 1999 Began making cover picture on "Monthly Minobu", magazines published by Minobu-san Kuon-ji temple, Nichiren sect. headquater (- 2004). Became a guest professor in Takasaki Art Center College, now University of Creation, Art, Music and Social Work (- 2006). Began serialize an essay in "Gekkan Bijutsu" Formed Ichiga-Kai with Shunsuke Enoki, Hiroaki Okada, Mihoko Yagi, Shigemi Noritomi, Tatsuo Ebisawa, Rimako Horikawa, Shunichi Seki, Taro Yamagata, Seiko Katagiri and Masako Yamamoto. Completed a ceiling painting at Zojoji temple, Jodo sect. headquarter. Had a special exhibition for celebrating the completion of the ceiling painting at Nihonbashi Mitsukoshi, Kyoto Takashimaya, Nagoya Matsuzakaya and Shizuoka Matsuzakaya Had a personal exhibition at Takasaki Suzuran Department Store. 2000 Appeared on a TV program titled "The World of Kei Shibusawa". 2001 Began showing paintings at Tokyo, Kyoto, Osaka, Toyama and Nagoya Bijutsu Club every year. Became a guest professor in Minobusan University. Made pictures for a special print for Nichiren sect. believers as for celebrating the 750th anniversary of Nichiren sect., published by Minobusan Kuonji temple. Had the special exhibition for celebrating the 30th anniversary of the normalization of diplomatic relations between China and Japan presented by and had at Shanghai Museum, China. Published a book of works by Shanhai People's Fine Arts Publishing House. 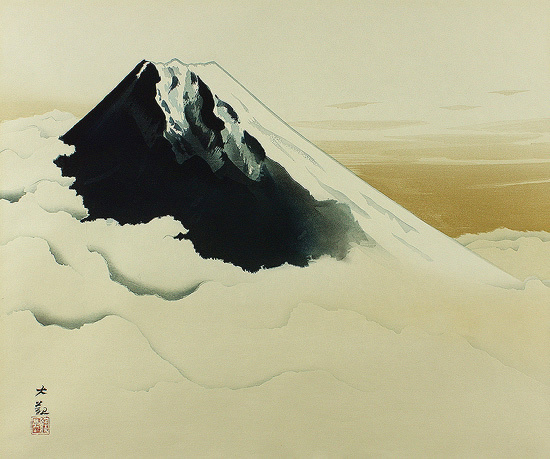 Painting "Jokai Seirei" had collected by Shanghai Museum. 2004 Began showing paintings at the annual event "Nihon no bi Exhibition" at Okayama, Hiroshima and Takamatsu Tenmanya every year. Showed paintings at the exhibition for celebrating the 100th anniversary of Nagoya Bijutsu Club. 2005 Had a special personal exhibition for celebrating his 30th anniversary as a painter at Nagoya Matsuzakaya Art Gallery. Showed paintings at Chinese International Art Gallery Expo. in Beijing. Showed paintings at Shanghai Art Expo. Showed paintings at the exhibition for celebrating the 100th anniversary of Tokyo Bijutsu Club. Works were shown at the International Asian Art Fair in New York. Works were shown at the special exhibition for celebrating the 100th anniversary of Mitsukoshi art department. Solo exhibition were held at Beijing, China Works were shown at the exhibition for celebrating the 100th anniversary of Kyoto Bijutsu Club. 2008 Works were shown at the World's Fine Art Fair in Moscow. 2009 Works have been shown at the exhibitions titled “21st Century Exhibition --dento kara no sozo” since 2001 in Tokyo, Kyoto, Osaka, Toyama and Nagoya Bijutsu Club. Works were shown in State Russian Museum, Russia. 2012 Kei SHIBUSAWA passed away at 63.